At Hidden Valley, you choose activities that interest you the most! HVC can be your art camp, horse camp, dance camp, water camp, farm camp, adventure camp, performing arts camp, sports camp or any combination of these great areas. You'll be part of four one-hour periods of class instruction daily. Feel free to create, explore and set goals in any programs. Parents and campers may let us know their wishes prior to the summer and we will help design camper programs. Professional instructors, caring and creative camp counselors and quality facilities and equipment enable HVC to achieve it's high summer camp programming standards. I enjoyed all of my activities very much, and I liked how we could choose them. I also liked my counselors. Arts and Crafts: High quality programs led by professional artisans and crafts people. Waterfront and Pool: Our private lake is a lovely setting for canoeing, windsurfing, fishing and kayaking. 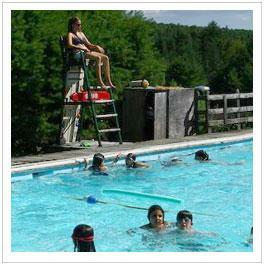 The lake and our 75' x 25' heated pool host swim instruction on all levels. Riding: HVC is now one of only a few all-round summer camps that also offers high quality English riding to all campers. Ropes Course: Professional outdoor educators and sophisticated safety equipment form the basis of exciting individual and group challenges. Performing Arts: Exceptional facilities and professional instruction are the backdrop for expression through theater, music, gymnastics and many forms of dance. Sports: Though we are "non-competitive," our campers enjoy athletics in tennis, basketball, softball and soccer led by sensitive, experienced coaches. Outdoor Adventures: Live in tipis, camp out at the ocean, hike or bike through the Maine woods, experience the great outdoors. Music: Join our rock band in the recording studio, sing a cappella, learn the guitar, practice piano, or learn percussion. 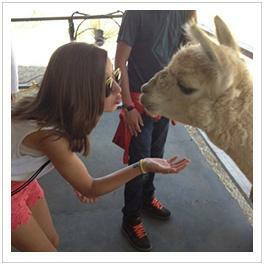 Llama and Animal Care: Hidden Valley is llama lland! In addition to tending our herd of exotic llamas, campers care for donkeys, rabbits, ducklings, and other farm animals. Communication Arts: Express yourself through video, photography, journalism and other writing activities. 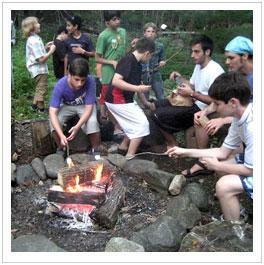 Programs For Teens: What happens when you are too old to to be a camper? Check it out! LEFT: Campers show off their giant puppet. RIGHT: An afternoon llama trek. You do a lot of creative things and offer activities and ideas to the children that are so expansive and ingenious. There's nothing like the spacious lovely Maine Coast. This group explores at Acadia Nat'l Park. Lola and Henry arrived home last night and were literally bubbling over with pure joy describing their month at Hidden Valley. From new friends to llamas to the Lion King, to Wheel of Misfortune, and the many wonderful art activities, they were effusive in their pleasure sharing experiences with us. 1:30 PM - Cabin activities; quiet time to write letters and relax. The success children experience in getting along with other children is the single best indicator of how they will fare as adults, according to recent research. We believe that summer camp - one that stresses the building of community and meaningful friendships - provides wonderful opportunities to help children develop their relationship - building skills. The programs that the camp offers is top notch. No "just getting by" in order to say they offer something. They consistently offer unusual and interesting programs, presented by a wonderful and dedicated staff. 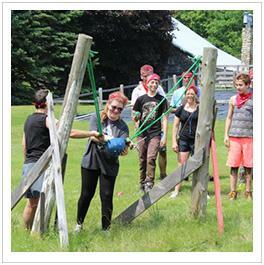 HVC activities and programs offer things no other camp does. Through your various programs she has learned self, compassion, horsemanship, and how to be adventurous and artistic. Campers enjoy warm summer afternoons in the pool! This older boys cabin enjoys a campfire complete with s'mores for their cabin night activity. YUM! 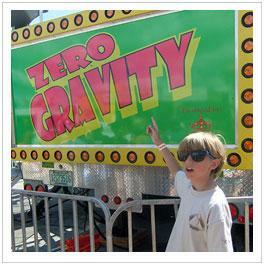 Getting ready for Zero Gravity at the Bangor State Fair.